Preliminary design drawing for Battleship # 40, which was planned for construction in Fiscal Year 1915. This plan resembles the design adopted for Battleship # 38 (see Photo # S-584-041) but differed in being smaller as a result of providing a reduced main battery (four twin 14-inch gun turrets rather than four triple 14-inch gun turrets.) It is not known what circulation outside the Bureau of Construction and Repair design team, if any, was made of this drawing. 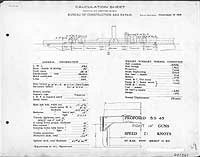 This plan provides eight 14-inch guns, turbine machinery, and a speed of 21 knots in a ship 590 feet long on the load water line (L.W.L. 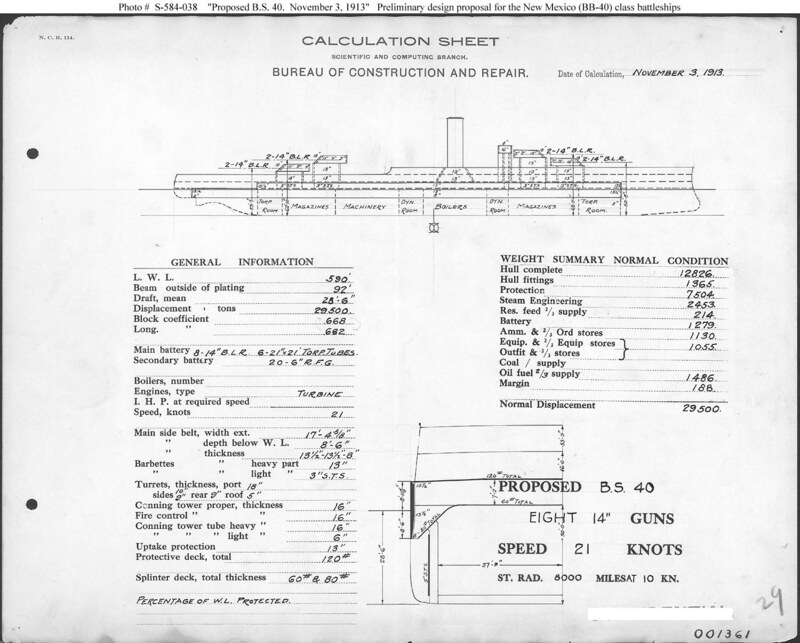 ), 92 feet in beam, with a normal displacement of 29,500 tons. Ultimately, however, Battleship # 40 was built to a design very similar to Battleship # 38, mounting twelve 14-inch guns.